Calfee’s Tax Litigation practice provides representation for companies and individuals before county boards of revision, the Ohio Tax Commissioner, Ohio Board of Tax Appeals, Ohio Supreme Court, and United States Tax Court. We advocate for our clients on matters that include real property tax complaints and exemptions, sales and use tax assessments and exemptions, public utility tax assessments, municipal income taxes, tax refund litigation, audits and federal administrative proceedings. Chambers researchers reported that sources describe Calfee's Litigation group as "highly responsive and their lawyers are really devoted to their clients' interest. 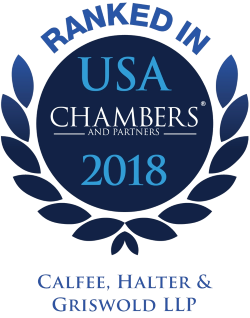 They're thoughtful, creative and they work hard"
Calfee's Litigation practice was selected for inclusion in the 2019 "Best Law Firms" rankings by U.S.News – Best Lawyers in America in Tax Law and several Litigation practice areas (national and metropolitan rankings).